It’s often many years after graduating before college students recognize the impact their favorite professors have had in their lives. 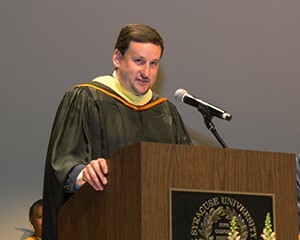 At the School of Information Studies (iSchool), however, graduates each year use convocation to honor the teachers who have been their greatest influences. This year, the iSchool’s graduate class chose Assistant Professor of Practice Renee F. Hill for the Jeffrey Katzer Professor of the Year Award, and the undergraduate class named Associate Professor of Practice Jeffrey Rubin, ’95, G’98 for the same honor. The Katzer Award recognizes outstanding teaching. Named for a beloved iSchool professor and interim dean, the memorial honors are based on students’ evaluation of excellence in teaching, engagement and scholarship. The recognition initially surprised Hill, then she felt “very honored and very gratified. I love what I do, and when I believe that students recognize that I do this because I really love it, it makes it that much more satisfying. It’s kind of a validation that the things I’m doing resonate with students,” she says. Renee Hill accepts her award at the graduate convocation. The professor was nominated for the award by Christina Johnson, a graduate student in the school’s master’s of library and lnformation science school media program. 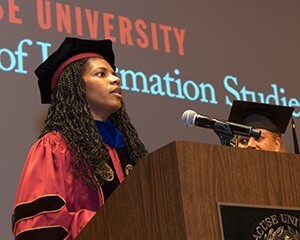 In an emotion-filled introduction, Johnson illustrated the bond between student and teacher, telling how her professor took time to talk her out of “panic mode” during the completion of her last academic paper. Johnson said she “had a brain freeze, and didn’t know how I’d get through it. Dr. Hill talked me off that ledge of insanity,” she joked, and she successfully finished her paper after a long night of writing. In a short address, Hill offered graduates “two truths” that she herself follows. Lifelong learning is important, whether it is formal or informal, she noted. “Download an app, learn a new language, visit a new place, read about topics you aren’t sure you’d be interested in , or do what I did, surround yourself with amazingly smart and talented people who teach even when they don’t know they’re teaching and who challenge you to push beyond what you thought was possible.” She also urged graduates to recognize the support others provide them, and exhibit “an attitude of gratitude” for that. Hill’s teaching is centered on increasing understanding about issues of diversity within library and information studies disciplines and information access for members of underrepresented populations. She earned her doctorate and master’s degree in information studies at Florida State University’s College of Information, and her bachelor’s degree in Exceptional Student Education at Florida Atlantic University. Jeff Rubin addresses students after being named Katzer Professor of the Year. Rubin attended the School of Information Studies as both an undergraduate and graduate student. He teaches more than 200 students a semester in IST 195, an overview course on the information age and the career paths students can pursue with an information science degree. He also teaches a course in the Global Enterprise Technology curriculum and helps shape the web design curriculum at the iSchool. Additionally, he heads a highly successful company that he founded in 1996 right out of school. SIDEARM Sports provides part-time jobs for dozens of students on campus and full-time careers for many other informational professionals.